A new garden has been officially opened at St Andrew’s Church in Bearsden as part of their 50th anniversary celebrations. 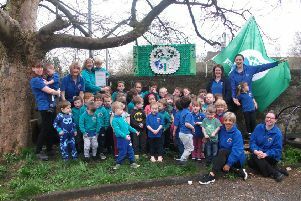 The “Spirit of Peace” garden was unveiled by St Andrew’s primary pupil Evie Thomas (7) on Friday, May 19 because she came up with the name for it. St Andrew's Church. Opening of new 'spirit of peace' garden. Evie Thomas P3 (7) with Father Makle. Work to create the outdoor space started last September when local school children planted spring flowering bulbs. All the work has been carried out by the parishioners of St Andrew’s. Local shop keepers, other churches, councillors, schools and members of the public were invited to the opening and enjoyed a light buffet in the lower hall of the church afterwards. The garden is open to the public and is accessed from Douglas Place. There is no need to enter the church to get access as the entry is from the public footpath on Douglas Place. St Andrew’s is also accessed from Douglas Place. The main car park for St Andrew’s is the EDC car park on Roman Road. Chair of the Parish pastoral council, John Heath, said: “There’s been considerable public enthusiasm about the new garden. It has already become a talking point and local cafes are going to offer a special take-a-way garden drink.